Don’t overlook your most prized branding tool. Whether you have a single vehicle wrap or a fleet of a hundred to brand, pardon the pun, but your vehicles are your more efficient branding vehicle you have. The Outdoor Advertising Association of America calculates mobile advertising to be the most effective and efficient form of out of home advertising. 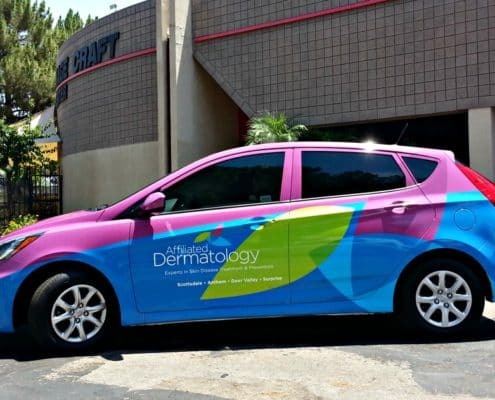 A vehicle wrap delivers a thousand impressions for around 4 cents, while other forms of advertising cost significantly more. 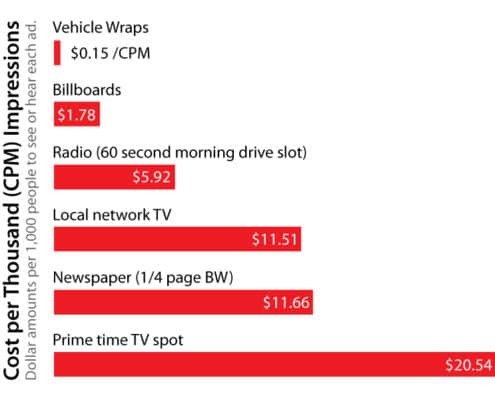 For instance, outdoor signs costs around $3.56 per thousand impressions and newspaper ads cost $19.70. 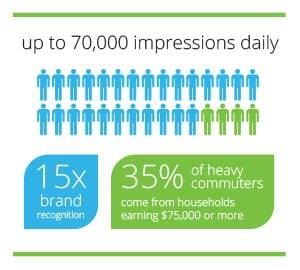 Not only does fleet vehicle advertising deliver a ton of impressions, but it also works, boosting name recognition 15 times greater than other forms of advertising. So don’t miss your easiest, most powerful and greatest efficient branding opportunity with a blank vehicle. Great graphics bringing classical music and break dancing together! Vehicle Wraps of all shapes and sizes. A gallery of a variety of wrapped vehicles from Smart Cars to helicopters and yachts. With the average American driving 302 miles per week, your wrapped vehicle can reach 30,000 to 75,000 potential customers every day. When you have four campuses stretching across the entire Phoenix valley, you need an efficient system to transport students around. With a fleet of twelve double-decker buses ASU, they are constantly visible seemingly everywhere. 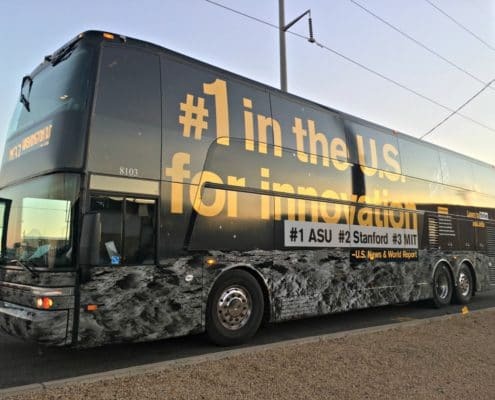 Knowing the power and efficiency of vehicle wraps, ASU opted to wrap the fleet promoting their “#1 in Innovation” campaign. Their research validated this decision with the bus wraps having higher recall than any other media. Check out our Gallery to see other vehicles we have wrapped.